We show in this study that incubation of freshly isolated bone marrow cells with Mycobacterium tuberculosis (M. tb) secretory Ag (MTSA), in the absence of any growth or differentiation-inducing factor, differentiates them into dendritic cell (DC)-like APCs. These DCs expressed moderate to high levels of various markers typical of DCs. These included T cell costimulatory molecules CD80, CD86, CD40, and CD54 and high levels of surface MHC class I and II on CD11c+ cells. The levels and the kinetics of up-regulation of these molecules were comparable with those of GM-CSF-differentiated DCs. Furthermore, these DCs exhibited morphology characteristics to DCs like the presence of dendritic processes. These DCs were also potent stimulators of allogeneic T cells and preferentially induced the secretion of IFN-γ over IL-10 from the interacting T cells. Interestingly, the differentiation of bone marrow cells into DC-like APCs was obtained with many other M. tb Ags, including whole cell extract of M. tb. Further characterization of MTSA-differentiated DCs showed that they were immature in nature, as stimulation of these DCs with TNF-α, anti-CD40, or LPS further up-regulated the surface levels of various molecules together with an increase in their T cell stimulatory capacity. The Ag-specific T cell responses of MTSA-differentiated DCs were mainly contributed by the CD4+ subset, indicating that MTSA was largely MHC II restricted. Furthermore, stimulation of bone marrow cells with MTSA induced the nuclear translocation of the transcription factor NF-κB, thereby indicating its role during MTSA-induced differentiation of DCs. M;-2qycobacterium tuberculosis (M. tb)3 continues to cause mortality and morbidity throughout the world, resulting in 3 million deaths and over 8 million new cases of tuberculosis each year (1, 2, 3). This problem is further compounded by the varied efficacy of immunizations with Mycobacterium bovis bacillus Calmette-Guérin (BCG), still considered to be the gold standard against which all other vaccines are measured (4, 5, 6, 7). This thus underscores the need to identify and elucidate factors that play a determinant role in generating protective immune responses against this pathogen (8, 9). Mycobacteria persist in macrophages within the granuloma in the organs of infected hosts (10). Numerous proteins secreted from the phagosomes of infected macrophages serve as targets for APCs recruited at sites of infection (11, 12, 13, 14, 15). Different subsets of dendritic cells (DCs) are among the most potent APCs of the innate immune system that have the ability to stimulate quiescent, naive, or memory T lymphocytes (16). DCs exist at various states of development, activation, and maturation that are defined by distinct phenotypic and functional modalities (17). For instance, DCs develop in the bone marrow (BM) and are subsequently transported to the periphery, such as lung epithelia, mucosae, and the like. These DCs and their precursors also patrol body fluids such as blood and lymph and are primarily immature in nature, meaning whereby that they are programmed for Ag capture and display very low levels of T cell stimulatory properties. Upon contact with various stimuli, such as LPS, TNF-α, CD40 ligand (by way of cognate interactions with T cells), and certain Ags (16, 17), they undergo a process of maturation. In this study, they up-regulate their MHC (class I and II) and costimulatory molecules (CD80, CD86, CD40, CD54) and are very efficient T cell stimulators (18, 19). In this study, we looked at the interactions of a recently described 10-kDa M. tb-specific Ag (hereafter referred as MTSA) (20) with leukocyte precursors, with a view to understand the interactions of mycobacterial secretory Ags with DC precursors. Our results indicate that MTSA and other M. tb Ags induce the differentiation of BM cells into DC-like APCs. The possible implications of M. tb-induced DC differentiation are discussed. Female BALB/c mice 4–6 wk of age were used in the study for all experiments involving DCs. For enrichment of T cells, either BALB/c or C57BL/6 mice were used. All the animals were maintained under pathogen-free environment-controlled conditions in the small animal facility of our institute. The study was undertaken after prior approval from the Institutional Animal Ethics Committee. FITC-tagged mAbs against mouse cell surface molecules CD80 (clone 1G10), CD86 (clone GL-1), CD40 (clone 3/23), CD54 (clone 3E2), I-Ad (clone AMS-32.1), H-2Dd (clone 3-25.4), CD16/CD32 (FCγR, clone 2.4G2), and biotin-conjugated Abs to CD11c (clone HL3), CD11b (clone M1/70), CD25 (clone 7D4), CD45R (B220) (clone RA6-3B2), CD43 (clone S7), CD90 (clone 53-2.1), and PE-conjugated CD4 (clone GK 1.5) and CD8a (clone 56-6.1), and purified CD16/CD32 (FCγR, clone 2.4G2), anti-CD40 (clones HM-40), and isotype-matched control Abs were purchased from BD PharMingen (San Diego, CA). FITC-conjugated Ab to F4/80 (clone CI: A3-1) and DEC 205 (clone NLDC 145) were obtained from Serotec (Oxford, U.K.). Anti-CD4-, anti-CD8-, anti-CD90 (Thy-1.2)-, anti-B220-, anti-CD11b-, anti-CD11c-, anti-I-A-, and anti-CD19-coated magnetic beads were obtained from Miltenyi Biotec (Auburn, CA). Mouse rGM-CSF and ELISA kits for the estimation of mouse cytokines were purchased from R&D Systems (Cambridge, MA). Recombinant TNF-α, LPS, and polymixin B sulfate and E-Toxate endotoxin detection kit were obtained from Sigma-Aldrich (St. Louis, MO). Ab to NF-κB p65 subunit was purchased from Santa Cruz Biotechnology (Santa Cruz, CA). Purified M. tb Ags ESAT-6, Ag85b, and MPT64, and M. tb whole cell extract were obtained from J. T. Belisle (Colorado State University, Port Collins, CO) under the National Institutes of Health, National Institute of Allergy and Infectious Diseases Contract AI-75320, entitled Tuberculosis Research Materials and Vaccine Testing. The details of their preparation and composition can be viewed at http://www.cvmbs.colostate.edu/microbiology/tb. The purity of these Ags obtained were further analyzed by SDS-PAGE, followed by silver staining. Furthermore, possible MTSA presence in the whole cell extract of M. tb was removed by incubation with rabbit anti-MTSA Ab, followed by immunoprecipitation with protein G-conjugated agarose beads. MTSA (M. tb Rv3874) was PCR amplified from the genomic DNA of a local clinical isolate of M. tb, and the recombinant protein was expressed as a polyhistidine-tagged protein (GenBank Accession AF419854) in Escherichia coli using the pQE31 vector (Qiagen, Valencia, CA). To exclude the possibility of endotoxin contamination in the recombinant protein, endotoxin levels were estimated in all the batches of MTSA (and other M. tb proteins) used in the study by utilizing the E-Toxate (Limulus amebocyte lysate; Sigma-Aldrich) kit. The endotoxin levels in all the proteins were found to be below 0.03 endotoxin units (data not shown). Furthermore, we also cultured BM cells with either heat-inactivated MTSA or MTSA pretreated with polymyxin B sulfate, known to inactivate LPS and its effects (21). Polymyxin B sulfate-treated MTSA, but not heat-inactivated MTSA, differentiated BM cells into DCs (data not shown). These results confirmed that the observed effects were a result of MTSA and not by any contamination by endotoxin(s) in the recombinant protein. A total of 3 × 106 lymphoid and I-A+-depleted BM cells from the tibias and femurs of BALB/c mice were cultured in six-well culture plates in RPMI 1640 medium containing 10% FCS, 0.05 M 2-ME, and 1 mM sodium pyruvate, and stimulated with Ags for various lengths of time. For some experiments, cells were cultured with 15 ng/ml of GM-CSF for 4 days. Cells at the end of incubation in all sets were either analyzed for the levels of surface molecules by flow cytometry, as described before (22), or cocultured with either allogeneic or Ag-primed syngeneic T cells, as described below. The cell yield and viability of each culture were estimated by trypan blue exclusion and counting. BM cells cultured with various Ags or GM-CSF were observed under a Nikon DiaPhot phase-contrast microscope and photographed on Kodak DX400 film using Nikon U-III camera. In some cases, cells were first stained for surface CD11c using biotinylated Ab, followed by streptavidin-PE. Aliquot of cells was mounted on glass slides and observed under microscope using Nikon G2A filter. The fluorescent cells thus observed were then photographed. This was done as described previously (23). Briefly, either inguinal lymph nodes or splenocytes from 4- to 6-wk-old BALB/c or C57BL/6 mice, respectively, were first depleted of adherent cells by panning over plastic plates. From this, B lymphocytes were then removed by two rounds of incubation with anti-CD19- and anti-CD45R-coated magnetic beads, followed by separation through MACS columns. The purity of the resulting population of T cells obtained in this fashion was 95–98%, as determined by CD90-PE-stained cells by flow cytometry. For some experiments, enriched T cells from the lymph nodes of BALB/c mice were further negatively selected as CD4+ or CD8+ populations using anti-CD4- or anti-CD8-coated magnetic beads and purification over MACS columns. The percentage of I-A+ cells in all the fractions was found to be less than 0.5%. Allogeneic C57BL/6 T cells were enriched from spleens, and 3 × 106 enriched T cells were cocultured with irradiated (3000 rad) MTSA-differentiated DCs at various DC:T cell ratios in 24-well plates for a period of 48 h. Culture supernatants were then screened for the presence of cytokines, as described below. For measuring T cell proliferation, different numbers of irradiated MTSA-differentiated DCs were cocultured with 3 × 105 allogeneic C57BL/6 T cells for 3 days in 96-well U-bottom cultures dishes. The cells were pulsed with 1.0 μCi/well of [3H]thymidine 16 h before harvesting and counting. BALB/c mice were immunized s.c. at base of tail with MTSA (50 μg/mouse) in IFA for 7 days and boosted with a repeat immunization for an additional 7 days. Inguinal lymph nodes from these mice were removed, and T cells (both CD4+ and CD8+) were enriched, as described above. Enriched T cells were cocultured with irradiated DCs at a 5:1 ratio for 48 h, and culture supernatants were analyzed for cytokines. T cell proliferation of Ag-primed T cells cocultured with MTSA-differentiated DCs was measured, as described above. Culture supernatants of DC-T cell cocultures at the end of each incubation period were analyzed for the levels of IL-2, IFN-γ, or IL-10 using a sandwich ELISA, as recommended by the manufacturer. The sensitivity range for the cytokines was as follows: IL-2, 15–1000 pg/ml; IFN-γ, 31.2–2000 pg/ml; and IL-10, 31.2–2000 pg/ml. Quantitation was made against a standard curve obtained for individual cytokine standards provided by the manufacturer. Samples were correspondingly diluted to obtain values within the linear range of the standards. BM cells were stimulated with either 10 μg/ml of MTSA or 15 ng/ml of GM-CSF for varying periods of time. At the end of the incubation, cells were chilled on ice and washed once with ice-cold PBS and lysed in lysis buffer (10 mM HEPES, pH 7.9, 10 mM KCl, 0.1 mM EDTA, 0.1 M EGTA, 0.5% Nonidet P-40, and 2 μg/ml each of aprotinin, leupeptin, and pepstatin). The resultant nuclear pellet was then extracted in buffer containing 20 mM HEPES, pH 7.9, 0.4 M NaCl, 1 mM EDTA, 1 mM EGTA, and 2 μg/ml each of aprotinin, leupeptin, and pepstatin. Nuclear extracts from 5 × 106 cells were then resolved on 10% SDS-polyacrylamide gels and subsequently transferred onto a nitrocellulose membrane (Hybond C pure; Amersham, Arlington Heights, IL). The blots were then probed with Ab to NF-κB p65 subunit, followed by HRP-labeled secondary Abs. The blots were later developed by chemiluminescence using the ECL kit from Amersham. A recent report identified MTSA, which was able to prime delayed-type hypersensitivity responses in M. tb-infected guinea pigs, but not in animals infected with M. bovis BCG (20). A product of Rv3874 gene in the mycobacterial genome, MTSA is not expressed by other members of the mycobacterial complex, namely, Mycobacterium avium and M. bovis BCG, among others. Recent reports documented the relevance of MTSA (also known as CFP-10) in generating protective immune responses against M. tb (24). CFP-10-pulsed monocyte-derived DCs were used to isolate CD8+ T cell clones that interacted with M. tb, but not M. bovis BCG-infected targets (25). Furthermore, owing to its absence in M. bovis BCG strains used for vaccinations, CFP-10 has been proposed as an important candidate in the diagnosis of M. tb (26, 27). Therefore, in light of the above, we argued that MTSA would make an ideal model to study M. tb-specific immune responses at sites of infection. To begin with, we examined the interactions of MTSA with leukocyte lineage precursors in the BM, as reflected by changes in the levels of cell surface molecules. For this, we incubated BM cells with various doses of MTSA and for different periods of time. Aliquots of cells were analyzed for the levels of molecules listed in Fig. 1⇓A. 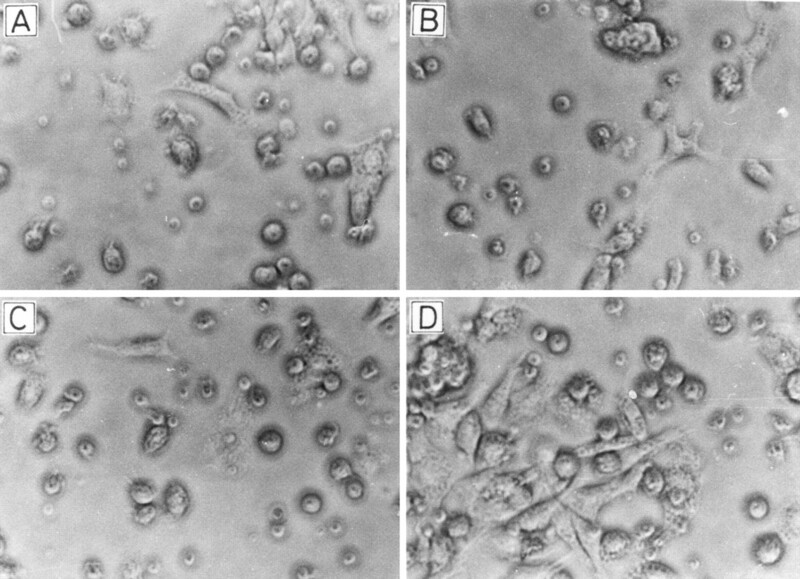 As shown, culturing BM cells with 10 μg/ml of MTSA up-regulated the levels of many molecules on the cell surface. These included both CD11c and CD11b. The bimodal nature of the peak in both CD11c and CD11b suggests that some cells (∼45%) were negative for these two markers. Furthermore, the CD11c+ cells were found to express high levels of CD80 (B7.1) and low levels of CD86 (B7.2). Majority of the CD11c+ cells expressed high levels of MHC class I (H-2D) and MHC class II (I-A) molecules. They were positive for CD40 and expressed high levels of CD54 (ICAM-1). These cells also stained positive for the DC maturation marker F4/80 Ag (28) and CD25, the IL-2Rα-chain. A side-by-side comparison of MTSA-stimulated cells was made with GM-CSF-stimulated cells, which is the conventional method used to generate DCs from BM cells (29). It is clear from Fig. 1⇓A that the levels of MHC class I and MHC class II and costimulatory molecules CD80, CD86, CD40, and CD54 were up-regulated to a similar degree in both MTSA- and GM-CSF-stimulated cultures. However, the levels of CD11c and CD11b were much higher in GM-CSF-stimulated cultures when compared with those incubated with MTSA. MTSA-stimulated cultures stained negative for FcR (CD16/CD32), which was expressed in GM-CSF-stimulated cells. Barring these minor differences, both GM-CSF- and MTSA-differentiated cells essentially expressed similar profiles of all the markers depicted in Fig. 1⇓A. This also included the absence of DEC205, CD8a, and CD4 molecules that are expressed primarily by plasmacytoid DCs (16, 17), indicating that like GM-CSF, MTSA-differentiated DCs were of myeloid origin. The CD11c−/CD11b− cells in MTSA DCs, however, were positive for all the other molecules that were expressed on CD11c+/CD11b+ cells (not shown), a characteristic observed on a subset of human plasmacytoid DCs (30). For the current study, both the CD11c+ and CD11c− populations were collectively used. MTSA induces the differentiation of DC-APCs from BM. A, Cell surface staining of indicated markers on BM cells cultured for 4 days either in medium alone (None) or 10 μg/ml of MTSA or 15 ng/ml of GM-CSF is shown by the thick line. The thin line depicts staining with the corresponding isotype-matched control Ab. CD11c and CD11b profiles are on propidium iodide-excluded cells. The profiles of all other markers are on CD11c+ cells. B, Shows the kinetics of induction of the various molecules on either MTSA (a)- or GM-CSF (b)-stimulated BM cells as a function of time; ▵, CD80; ▪, CD86; ○, I-Ad; □, H2-Ld; ▴, CD40; •, CD54. Data shown are representative of at least five such experiments. Both MTSA- and GM-CSF-stimulated cells did not express CD45R (B220), CD90, or CD43, markers specific for B and T lymphocytes and macrophages, respectively. These results thus indicate that MTSA induces the differentiation of DCs from BM leukocyte precursors. Furthermore, the kinetics of expression of these markers followed a consistent pattern, wherein most of the molecules were up-regulated with similar kinetics, CD86 levels being consistently low throughout the culture period in MTSA-differentiated DCs, when compared with GM-CSF-differentiated DCs (see Fig. 1⇑B). Up-regulation of most markers reached a peak at 4 days of incubation. Dose-response profiles of MTSA (not shown) also showed a similar trend, with maximal differentiation of cells (that were also positive for markers shown in Fig. 1⇑A) reaching a plateau at 10 μg/ml. Hence, for all subsequent experiments, BM cells were cultured with 10 μg/ml of MTSA for a period of 4 days for further processing or analyses. We also estimated the cell yield and viability of each culture, and the results are depicted in Table I⇓. As can be seen, the viability of cells cultured in medium alone decreases progressively with each day of culture, and only 65% of the total cells initially plated were found to be viable. In contrast, cells cultured with MTSA increased in number by day 3, and by day 4 the total yield of viable cells went up by 30%. Similarly, the number of cells cultured with GM-CSF also increased, and were 155% of the total cells plated on day 0. The low level of cell expansion observed could possibly be a result of a single addition of either GM-CSF or MTSA as against repeated additions during the generation of DCs by conventional methods (29). Furthermore, this yield and viability of MTSA-stimulated cultures were maintained for up to 6 days, and then started to decrease by day 7 (not shown). The yield and viability of GM-CSF-stimulated cultures were, however, maintained beyond 7 days of culture (not shown). Phase-contrast microscopic examination of these cells showed that MTSA-differentiated DCs displayed morphological characteristics typical of DCs, which included the presence of dendritic processes or veils (Fig. 2⇓B). Some cells were, however, rounded in appearance. GM-CSF-differentiated DCs also displayed veils or processes in most cells (see Fig. 2⇓C). Cells cultured in medium alone did not show any processes or other features typical of DCs and were smaller and shriveled in appearance (see Fig. 2⇓A). Furthermore, both MTSA- and GM-CSF-differentiated DCs stained positive for CD11c, as revealed by fluorescence microscopy (see Fig. 2⇓, E and F). No fluorescence for CD11c was observed on cells cultured in medium alone (see Fig. 2⇓D). The collective results in Figs. 1⇑ and 2⇓ thus suggest that MTSA induced the differentiation of cells that phenotypically and morphologically displayed features of DC-like APCs. MTSA-differentiated DCs display DC morphology. BM cells were cultured with MTSA or GM-CSF for 4 days. Cells were then observed under Nikon Diaphot phase-contrast microscope and photographed (magnification ×500) (see Materials and Methods). A–C, Shows morphology of cells cultured in medium alone, MTSA, and GM-CSF, respectively. An aliquot of cells from the above cultures was stained for CD11c. D–F, Depicts CD11c staining on cells cultured in medium alone or MTSA or GM-CSF, respectively (magnification ×500). One of the functional attributes of DCs is their remarkable ability to stimulate allogeneic T cells at very low stimulator to responder ratios. To ascertain that MTSA-stimulated BM cells were DC-like APCs, which were potent T cell stimulators, we cocultured them with allogeneic T cells at various DC:T cell ratios, and the extent of T cell stimulation was assayed by measuring thymidine incorporation, IL-2 production, as well as IFN-γ and IL-10 secretion from allogeneic T cells. As shown, MTSA-differentiated DCs readily stimulated T cells to secrete IL-2, IFN-γ, and IL-10 at ratios as low as 1:50 (see Fig. 3⇓, B–D). The thymidine incorporation by these T cells was also evident at ratios 1:50, thus indicating that MTSA-differentiated DCs were efficient T cell stimulators (Fig. 3⇓A). Furthermore, the extent of either the thymidine incorporation or cytokine production was comparable with GM-CSF-differentiated DCs, indicating that MTSA-differentiated DCs were equally efficient in stimulating T cells when compared with DCs generated by conventional methods. 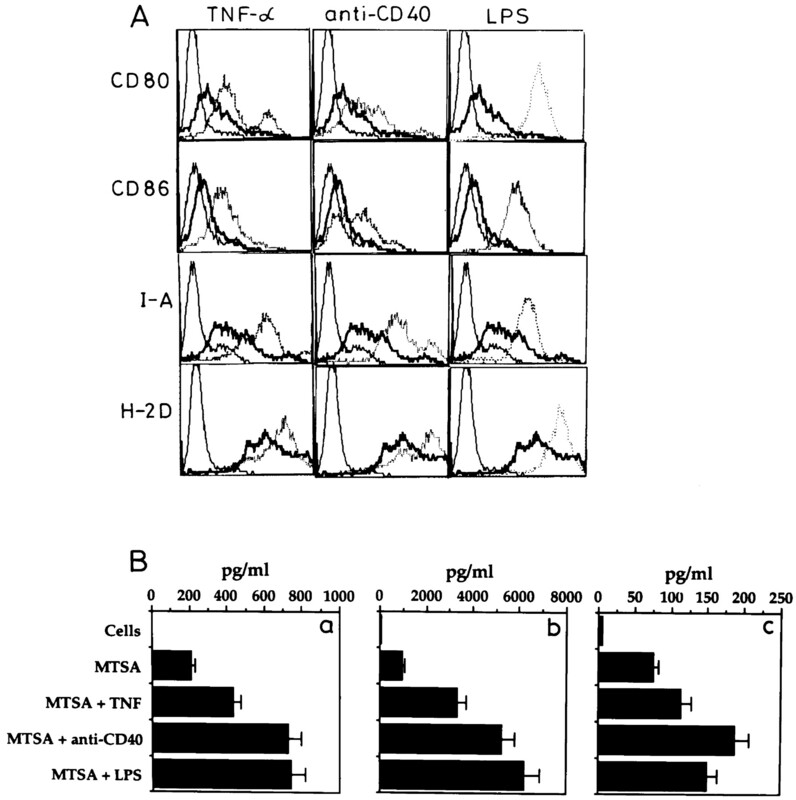 MTSA-differentiated DCs stimulate allogeneic T cells. A, 3 × 105 allogeneic C57BL/6 T cells were cocultured with different numbers of irradiated MTSA- or GM-CSF-differentiated DCs (see Materials and Methods) in 0.2-ml culture volume in 96-well plates for a period of 72 h. Cultures were pulsed with 1.0 μCi/well of [3H]thymidine 16 h before harvesting and counting. B–D, 3 × 106 C57BL/6 T cells were cocultured with different numbers of irradiated MTSA- or GM-CSF-differentiated DCs for 48 h, and culture supernatants were then screened for the levels of indicated cytokines. None, represents cells cultured in medium alone. One of four independent experiments is shown. To test whether the observations made in Figs. 1⇑ and 2⇑ were specific to MTSA, we looked at the ability of various Ags to induce the differentiation of DCs. For this, we chose three different M. tb Ags, ESAT-6, Ag 85b (Ag85b), and MPT64, and also M. tb whole cell extract. These Ags were chosen primarily on their demonstrated ability in potentiating immune responses to M. tb. Although both MTSA and ESAT-6 are cotranscribed from the RD1 region of the Mycobacterium genome, they are translated as two separate proteins (31). ESAT-6 has been designated as an important T cell Ag recognized by protective T cells in animal models of infection with M. tb (32). Furthermore, together with MPT64, ESAT-6 has been shown to have potential in the diagnosis of M. tb, as they are recognized by T cells in animal models (33, 34) of M. tb. Like MTSA, both Ags have been found primarily in M. tb, but not in most environmental mycobacteria or BCG (35, 36). MPT64 has been evaluated as a skin test reagent in the guinea pig models of tuberculosis (37) and in humans (38). They have been shown to elicit delayed-type hypersensitivity responses in guinea pig models of tuberculosis. Furthermore, ESAT-6 has been considered as a potential candidate for subunit-based vaccines (39). Ag85b is a member of the Ag 85 complex, a family of fibronectin-binding proteins involved in the mycobacterial cell wall biosynthesis (40). In addition, Ag 85b has been used as a potential DNA vaccine candidate (41). All of these Ags are secreted into the extracellular medium in axenic cultures, and some have been identified to be secreted from the phagosomes of mycobacteria-infected macrophages (11). Therefore, in light of the above, we thought it would be worthwhile to investigate whether the observed effects of MTSA could be reproduced by these Ags. As the cell wall components of BCG have been shown to induce the maturation of DCs (42), we also tested the ability of whole cell extract of M. tb to induce the differentiation of DCs from BM cells. We first ascertained the purity of these Ags by resolving them on SDS-PAGE, followed by silver staining of the gels. As shown in Fig. 4⇓A, all these proteins were found to be essentially pure, as revealed by the presence of a single band at the right sizes. Furthermore, no presence of MTSA in any of these Ags was observed. In addition, to rule out the presence of MTSA in the whole cell extract of M. tb, the same was incubated with anti-MTSA Ab, followed by immunoprecipitations using protein G-conjugated agarose beads. Fig. 4⇓B shows the representative FACS profiles of surface levels of various markers on cells cultured with different M. tb Ags. As shown, all the four Ags reproduced the effects of MTSA by differentiating BM cells into DC-like APCs, with high expression of surface MHC and costimulatory molecule. The levels of up-regulation of all the molecules were the highest, with cell extract and relatively lowest in MPT64-differentiated DCs. Morphologically also, these cells resembled DCs with the presence of dendritic processes (see Fig. 5⇓). These results thus indicate that M. tb Ags induce the differentiation of DCs from BM precursors. MTSA induce differentiation of DCs. A, 1 μg of different Ags was electrophoresed on a 12.5% SDS-polyacrylamide gel, followed by silver nitrate staining. B, Thick line shows the representative FACS profiles of indicated surface markers on BM cells cultured with 10 μg/ml of various M. tb Ags for 4 days. The thin line depicts staining with the isotype-matched control Ab. Data from one of three experiments are shown. DCs differentiated by M. tb Ags show dendritic morphology. BM cells were cultured with M. tb Ags for 4 days and observed under phase-contrast microscope and photographed as before (magnification ×500). A–D, Represents cells cultured with ESAT-6, Ag85b, MPT64, and M. tb cell extract, respectively. We also tested the ability of various other Ags, including the hepatitis E virus ORF3, Plasmodium falciparum MSP119, keyhole limpet hemocyanin, OVA, and chicken egg lysozyme, to differentiate BM cells into DCs. These Ags failed to either up-regulate the cell surface markers or induce changes in morphology of BM cells (data not shown), indicating that only M. tb Ags (at least the ones tested) were able to differentiate BM cells into DCs. It is well known that DCs present at various stages of activation and maturation perform distinct functions that are characterized by Ag capture vs T cell stimulation (16). Immature DCs are proficient at Ag capture, while mature DCs are effective T cell stimulators. We, therefore, investigated the maturation status of MTSA-differentiated DCs by further separately stimulating them with maturation-inducing factors such as TNF-α, anti-CD40, and LPS (17). Their effects were evaluated at the levels of modulation in the cell surface densities of various costimulatory and MHC molecules and the subsequent effects on allogeneic T cell responses. Addition of all the three stimuli individually led to an increase in the levels of costimulatory and MHC molecules (Fig. 6⇓A). This increase was also reflected in the increased expression of IL-2, IFN-γ, and IL-10 levels from allogeneic T cells (see Fig. 6⇓B). The results depicted in Fig. 6⇓, therefore, indicate that MTSA-differentiated DCs were only partially mature. Furthermore, there was no apparent effect on the morphology of MTSA-differentiated DCs upon stimulation with any of the maturation-inducing stimuli (data not shown). However, cell yield in the LPS-stimulated MTSA-differentiated DCs did show an increase by 20% when compared with MTSA-differentiated DCs (not shown). The cell viability in all cultures remained above 98%. MTSA-differentiated DCs are immature. Day 4 MTSA-differentiated DCs were incubated with either TNF-α (20 ng/ml), anti-CD40 (clone HM-40; 20 μg/ml), or LPS (20 μg/ml) for 24 h. A, Cells were stained for the surface levels of various markers. 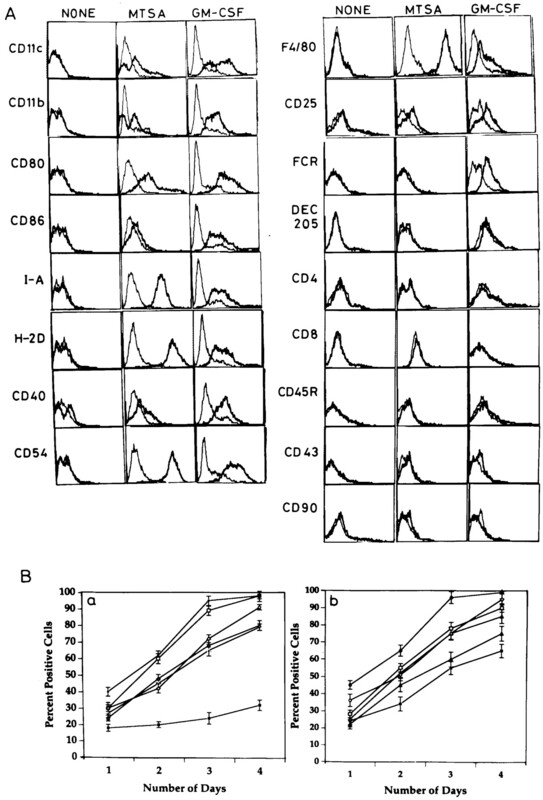 The thick line depicts levels in MTSA-differentiated DCs, while the dotted line depicts levels on MTSA-differentiated DCs stimulated with either TNF-α or anti-CD40 or LPS, respectively. The thin line depicts levels on cells cultured in medium alone. 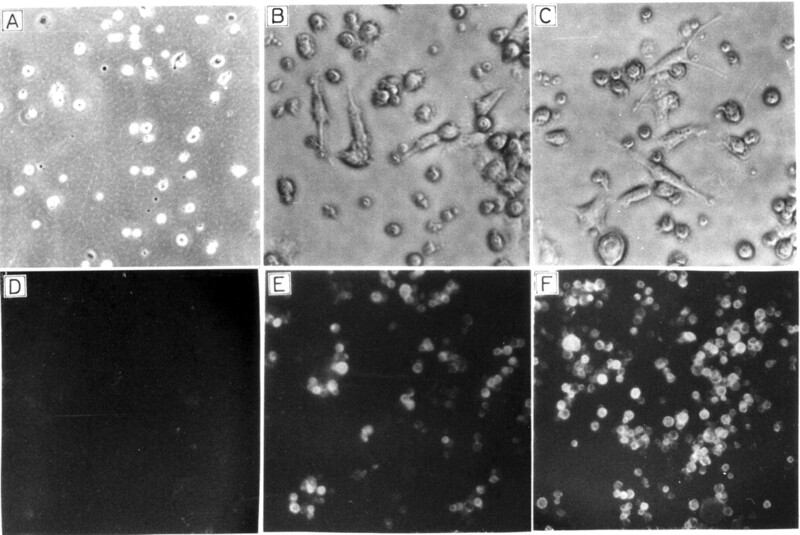 B, An aliquot of 0.6 × 106 cells from the above sets was cocultured with 3 × 106 C57BL/6 enriched T cells for 48 h. Culture supernatants were then screened for the levels of IL-2 (a), IFN-γ (b), and IL-10 (c), respectively. To check whether MTSA is processed and presented during the course of DC differentiation, we next explored the kind of Ag-specific T cell responses that are regulated by MTSA-differentiated DCs. 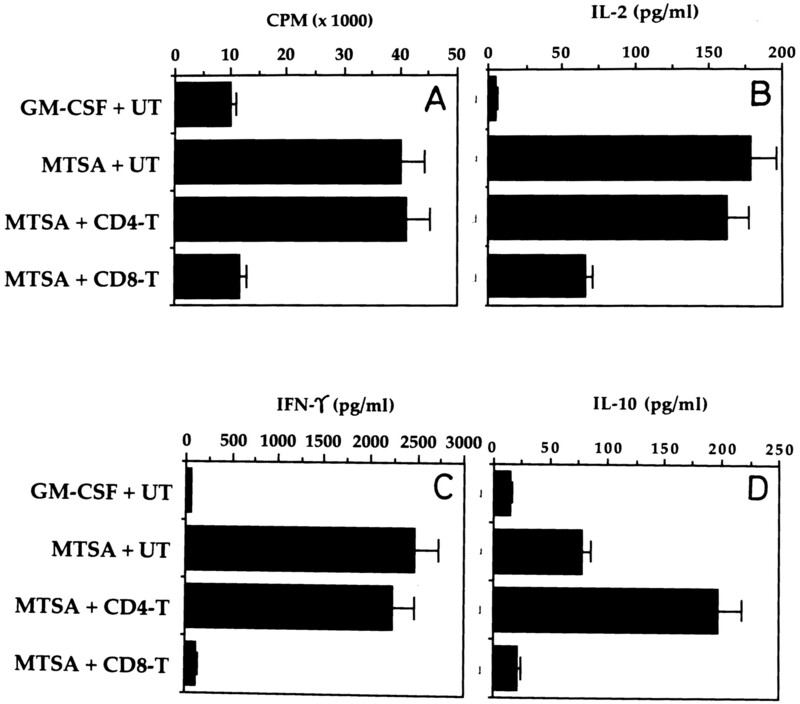 MTSA-differentiated DCs were cocultured with either unfractionated or CD4+ or CD8+ MTSA-specific T cell subsets, and the extent of T cell stimulation was monitored, as reflected in levels of thymidine incorporation and secretion of IL-2, IFN-γ, and IL-10 from the interacting T cells. As shown in Fig. 7⇓, and consistent with allogeneic T cell responses, MTSA-differentiated DCs stimulated Ag-specific T cells with high levels of thymidine incorporation and IL-2 production (see Fig. 7⇓, A and B). Higher levels of IFN-γ were observed when compared with IL-10 (Fig. 7⇓, compare C with D). 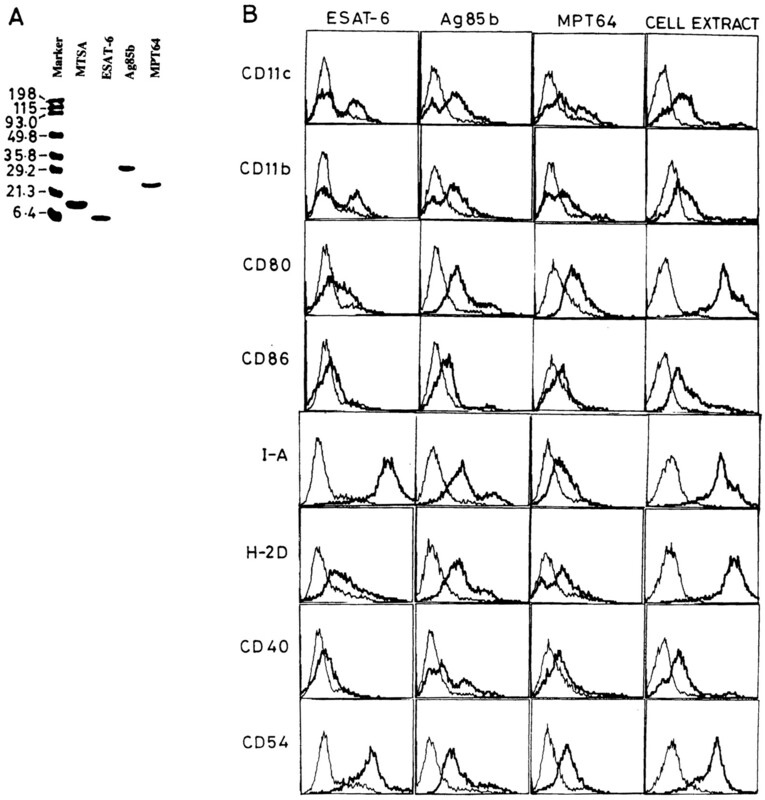 Furthermore, major contribution toward T cell stimulation was obtained by the CD4+ T cell subset, indicating that MTSA was primarily MHC class II restricted. CD8+ T cell-mediated responses were only marginal. This was further confirmed in coculture experiments wherein addition of an antagonist anti-MHC class II Ab reduced the IFN-γ responses to near basal levels, while the addition of anti-MHC class I Ab had marginal effects on both IFN-γ and IL-10 responses (data not shown). These results are in agreement with studies that document the dominance of CD4+ over CD8+ T cell responses during early infection by M. tb (10). Furthermore, as no significant proliferation or cytokine secretion was observed in groups in which GM-CSF-differentiated DCs were cocultured with MTSA-specific T cells, these results indicate that the observed responses from MTSA-differentiated DCs were indeed Ag-specific T cell responses and not a result of syngeneic MLRs. Ag-specific T cell responses induced by MTSA-differentiated DCs are CD4 restricted. A, 0.6 × 105 irradiated MTSA-differentiated DCs were cocultured with either 3 × 105 unfractionated or CD4+ or CD8+ MTSA-specific T cells in 96-well plates for 72 h. Cultures were pulsed with 1.0 μCi/well of [3H]thymidine 16 h before harvesting and counting. B–D, 0.6 × 106 irradiated MTSA-differentiated DCs were cocultured with 3 × 106 unfractionated or CD4+ or CD8+ MTSA-specific T cells in 24-well plates for 48 h. Culture supernatants at the end of incubation period were screened for the levels of indicated cytokines. UT, CD4-T, and CD8-T represent unfractionated, CD4+, and CD8+ MTSA-specific T cells, respectively. One of three experiments is shown. Activation of NF-κB has been considered as a hallmark of DC maturation (43). Furthermore, NF-κB binding sites have been reported in the regulatory sequences (promoters and enhancers) of costimulatory and MHC molecules (44, 45). In addition, it has recently been reported that differentiation of DCs from monocytes by calcium ionophores or LPS involves the activation of NF-κB (46). To test whether MTSA-induced differentiation of DCs involved the activation of NF-κB, we stimulated BM cells with either MTSA or GM-CSF for varying periods of time and looked at the nuclear translocation of the p65 subunit of NF-κB, which is the predominant species translocated to the nucleus upon activation and has been shown to regulate multiple immune response genes (47). It is clear from Fig. 8⇓ that p65 is indeed translocated to the nucleus in both MTSA- and GM-CSF-stimulated BM cells, although with different kinetics. NF-κB p65 could be seen in the nucleus by 30 min upon MTSA stimulation and was retained there for up to 2 h, while in GM-CSF-stimulated cultures, it was activated within 15 min, but disappeared by 2 h. Nevertheless, both stimuli activated this transcription factor, which suggests that activation of this transcription factor could be one of the pathways used by MTSA to induce differentiation of BM cells into DC-like APCs. Furthermore, incubation of potent and specific inhibitors of NF-κB such as N-acetylcysteine and capsaicin completely prevented the differentiation of DCs by MTSA (data not shown), indicating an obligatory role of this transcription factor in mediating differentiation of DCs by MTSA. Differentiation of DCs by MTSA involves nuclear translocation of NF-κB p65. BM cells were stimulated with either 10 μg/ml of MTSA or 15 ng/ml of GM-CSF for indicated periods of time, and nuclear extracts were prepared (see Materials and Methods). These were resolved on a 10% SDS-PAGE, Western blotted onto nitrocellulose membranes, and probed with Ab to p65 subunit of NF-κB, followed by HRP-conjugated secondary Ab. Blots were later developed with ECL reagents (Amersham). M, represents unstimulated BM cells cultured in medium alone for 60 min. M. tb Ags have been in focus for more than a decade ever since their identification in axenic cultures. Since then, a number of studies document the potential of these Ags in regulating immune responses in animal models and in humans, which among others includes the use of these Ags as potential vaccine candidates in the form of either adjuvants or even DNA (32, 33, 34, 35, 36, 37, 38, 39, 40, 41). Despite these studies, lacunae still exist regarding their physiological roles at sites of infection. Only very recently has their in vivo presence been demonstrated (11). Recently, the 19-kDa lipoprotein of M. tb has been shown to induce the maturation of DCs (48). Secretion of Ags from the phagosomal complex of infected macrophages into the extracellular matrix is likely to be followed up by their uptake by APCs such as DCs and their precursors, which are recruited to infected areas almost immediately following any infection. Therefore, the outcome of the interactions of these proteins with the APCs may well constitute the driving force for the nature of immune responses to M. tb that are subsequently generated and can eventually determine the course of an infection. In light of the above, the present study was undertaken to explore for any possible interactions of MTSA with BM leukocyte precursors. Our results demonstrate that incubation with MTSA did induce the differentiation of BM cells into DC-like APCs. This was based on the phenotypic and morphological attributes observed on these cells, which included the high cell surface expression of a number of markers such as the MHC class I and II and T cell costimulatory molecules, CD80, CD86, CD40, and CD54 on CD11c+ cells. Furthermore, the levels and kinetics of up-regulation of these molecules, as well as the morphological features, such as the presence of dendritic processes or veils, were comparable to those observed during GM-CSF-mediated DC differentiation. Apart from phenotypic and morphological resemblance to GM-CSF-differentiated DCs, those obtained with MTSA were also functionally competent, as they were equally efficient T cell stimulators and induced the proliferation of and cytokine secretion from the interacting allogeneic T cells. Indeed, MTSA was also processed and presented during the course of DC differentiation, as these DCs efficiently stimulated the proliferation and secretion of cytokines from MTSA-specific T cells. Furthermore, the Ag-specific responses were dominated by the CD4+ T cell subset, indicating that MTSA was largely presented on MHC class II. Interestingly, the differentiation of DCs from BM precursors was also obtained by three other immunologically well-characterized M. tb Ags, ESAT-6, Ag85b, and MPT64, and also by M. tb whole cell extract. Differentiation and, for that matter, activation/maturation of DC precursors by infectious agents or their components have determinant effects on the subsequently elicited immune responses. Modulation of DC activation and function by a large number of pathogens has been reported in the literature. For example, EBV inhibits the development of DCs by causing apoptosis of their monocyte precursors (49). Prevention of DC activation/maturation by P. falciparum-infected erythrocytes has also been recorded (50). These cells prevent the up-regulation of costimulatory and MHC molecules on immature DC precursors, and thus affect DC function. Infection of human DCs by Trypanosoma cruzi prevents their maturation by blocking the up-regulation of various T cell stimulatory molecules, and also drastically inhibits the secretion of cytokines such as TNF-α, IL-12, etc. (51). Furthermore, in addition to subsets of immature DCs, it is now known that two types of DC precursors arise from stem cells, monocytes (pre-DC1) and plasmacytoid cells (pre-DC2) (52). Pre-DC1 ingest and kill various bacteria and fungi, while pre-DC2 represent the key effector cells in early antiviral innate responses by producing large amount of IFN-α/β upon viral infection (53). Unlike other effector cells of the innate immune system, pre-DC1 and pre-DC2 have the capacity to differentiate into DCs, an event that occurs spontaneously in the absence of exogenous cytokine addition (53). Depending upon the kind of stimulus, the subsequently elicited T cell responses of these DCs also differ, indicating functional plasticity in regulating T cell responses that result from the differentiation-inducing stimulus (52). Therefore, in light of the above findings, and when coupled with the enormous potential of DCs in initiating primary immune responses, the differentiation of DCs by M. tb Ags assumes paramount importance in the subsequently generated immune responses to mycobacteria early in the infection. As the MTSA-differentiated DCs were found to be primarily immature in nature, by definition, they should be responsive to a second challenge by Ag(s), which might include uptake of either whole bacteria or parts thereof. 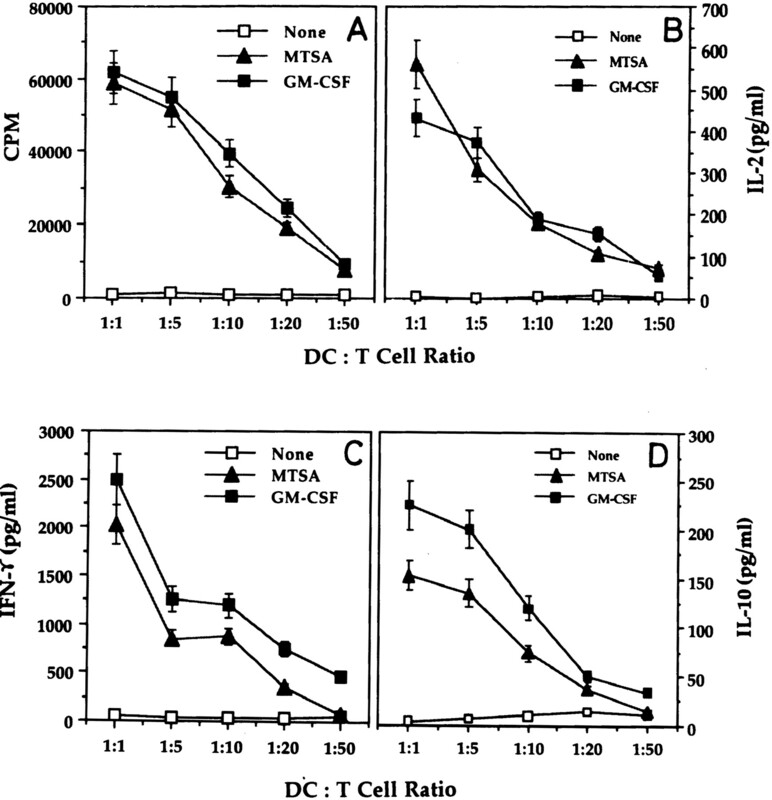 Surprisingly, however, when MTSA-differentiated DCs were pulsed with M. tb cell extract and cocultured with cell extract-specific T cells, the IL-2 and IFN-γ levels of these T cells became severely down-regulated with a concomitant increase in their IL-10 levels, indicating the probable development of suppressor/regulatory responses (our unpublished results). These results thus indicate a putative physiological role for these secretory Ags and possibly mimic the early events that would ensue during an infection, wherein the differentiation of DCs by the secretory proteins of M. tb Ags might be followed up by the release of bacteria from macrophages, and eventually leads to a down-regulation of proinflammatory responses to mycobacteria. Furthermore, the immature nature of MTSA-differentiated DCs might perhaps be an added advantage to mycobacteria, possibly by serving as transport vehicles to migrate to secondary lymphoid organs, as has been proposed by others (54). However, more precise and detailed experiments are required to support the above hypothesis. Toward identifying intracellular intermediates that may be modulated during MTSA-mediated DC differentiation, we looked at the activation of NF-κB that has been suggested to play a vital role in the differentiation of DCs (43, 44, 45, 46, 47). Indeed, the p65 subunit of NF-κB did translocate to the nucleus within 30 min of stimulation, indicating a possible role of this transcription factor during MTSA-induced differentiation process. Furthermore, MTSA DCs also secreted proinflammatory cytokines TNF-α, IFN-γ, IL-12p40, and IL-12p70 during the course of differentiation (data not shown). TNF-α has been shown to induce differentiation of DCs that also involves the activation of NF-κB. Therefore, activation of NF-κB followed by secretion of TNF-α may be one of the mechanisms of MTSA-induced DC differentiation. Further characterization of MTSA-induced DC differentiation is currently being followed. We gratefully acknowledge the kind gift of various M. tb Ags, Ag85b, ESAT-6, and MPT64, and whole cell extract from Dr. J. T. Belisle (Colorado State University) under the National Institutes of Health, National Institute of Allergy and Infectious Diseases Contract AI-75320, entitled Tuberculosis Research Materials and Vaccine Testing. K.N. thanks Ravinder Kumar for assistance in photography. ↵1 This work was supported by Defense Research and Development Organization Grant DALS/48222/LSRB/22/ID/RD/-81 to K.N. and P.S. ↵3 Abbreviations used in this paper: M. tb, Mycobacterium tuberculosis; BCG, bacillus Calmette-Guérin; BM, bone marrow; DC, dendritic cell; MTSA, M. tb secretory Ag. World Health Organization. 1998. Global Tuberculosis Control World Health Organization, Geneva. Steinman, R. M.. 1999. Dendritic cells. W. E. Paul, ed. Fundamental Immunology 547 Lippincott-Raven Publishers, New York.